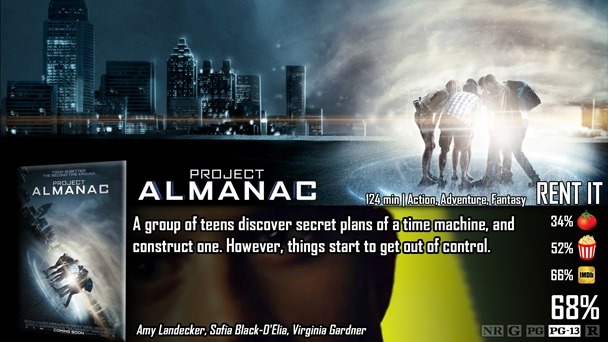 I could have sworn I saw the trailer to Project Almanac a long, long time ago – I thought it looked like a great concept, reminiscent of Chronicle, in that it is a found-footage teenage epic where something sci-fi and impossible happens. Instead of super powers, you have time travel, which is perfect. When it came out, however, an outpour of horrible reviews came out and are continually piling on top of each other. I understand their complaints, but at the same time, was it ever supposed to be anything more than it was? Probably not, and you can’t ignore that. I personally think it is okay, just not good enough for a buy. Project Almanac stars a number of unknowns in the lead as they go to high school and prepare for college. David Raskin (Jonny Weston) is an ambitious teen that might remind you of a young Tony Stark that dreams of one day going to MIT, but doesn’t exactly have the funds to do that. When he and his friends discover blueprints to a time machine, they use their intellect to build it and make a wearable version to go around town fixing wrongs in their own life and just having fun. I’ve heard certain complaints about this movie, and I want to talk about them too. Everyone who watches these movies always seem to want the same thing – a time travel movie where characters on screen go to real events that actually happened and affected the nation. Like Woodstock, for example. However, almost every time travel movie doesn’t do this and instead introduces its own storyline that’s important to its own characters. Back to the Future is one of the many films that did this, and so did Project Almanac. Basically speaking, think of The Butterfly Effect when watching it. It’s all about these fun-loving characters that get a little in too deep with what their messing with, and when things get affected by the ripple effect, David continually tries to fix it and keeps screwing things up. That’s ultimately what bugged me here, it was unoriginal in the sense that it ultimately started to feel like a cheap rip-off of The Butterfly Effect, except it wasn’t as dark. I never once cared that they didn’t visit historical events, but when time travel movies step on that butterfly and change the course of history, they also get in too deep with where loop holes might be, and there is a pretty big loop hole here – there may be an easy explanation when it happens, but because it didn’t even touch the subject, it feels like a mistake. Another part of the film that didn’t really spark my interest was the characters. They click, sort of, but I’ll probably wake up tomorrow forgetting their names, and the next day I may have forgotten everything about them because I simply didn’t care about them. If you don’t have loveable characters, you don’t have a solid story anymore, because it’s completely based off of these characters and depends on them in order to work as a whole. It has its moments, but all I’m saying is that it could have been a lot better. No opening credits/subtitles – Actually, there wasn’t any opening credits or subtitles, but there was a couple of production company logos, which are clearly not found on any footage randomly found. Appears to be unedited – Truth be told, this was dealt with pretty well as well, but not perfectly. There are some moments when the camera turns where you can really tell it was edited. Shaky Cam – Definitely shaking here, which is completely fine. No background music – There wasn’t any background music, but they did play a lot of current songs on the radio and listened to them in concert. That’s an easy way out, and I don’t have a huge issue with it. If you REALLY want music in a movie, and I’m guessing a teen movie does, they did what they could. Bad quality/ultimately looks amateur – Not at all, this movie is completely HD and has clear post-production effects and color correction, as well as sound recording and editing that makes absolutely no sense from an amateur standpoint. I figured that though, so I don’t really care too much about that. – BUT I completely understand why others would be pissed at that. So my judgment on found footage for Project Almanac is that it would have done a lot better as just a standalone movie. It’s cool to throw a camera back in time and everything, and the importance of the camera becomes more apparent towards the end, but not so much that I wouldn’t say hey, this could have done better as just a plain movie. Found footage = unnecessary and possibly hurt it overall. The real reason why I liked this a bit more than most is probably because I’m a huge fan of Chronicle, and the complete and overall feel of Project Almanac almost feels like a spiritual sequel of the other film, and I do like the feel of both movies. It’s interesting, a lot of kids would probably have a lot of fun with it, which was the point the whole time anyway. It could do better, much better. It took a really long time to build up to the whole time-travelling aspect because it wanted to introduce you to all of the characters and situations, and because this movie isn’t that long – they needed to get on with it. I get it, science! Let’s just speed things along, shall we. I wasn’t waiting for them to go back in time and kill Hitler, but I can’t express how interested I was in seeing them travel to the future, which doesn’t happen in the movie…so that sucked.